Lymphedema is the accumulation of lymphatic fluid that causes swelling in the body's tissues, most often found in the arms or legs, but can also affect the face, neck, trunk, genitalia, and abdomen. 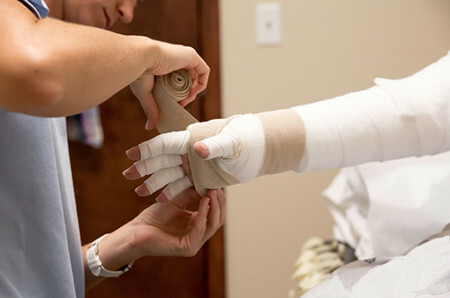 There is no cure for lymphedema, but early intervention and management techniques enable most patients to lead normal lives. Burke’s certified lymphatic therapists implement the Complete Decongestive Therapy approach (CDT) with their lymphedema patients. Treatment may include manual lymphatic drainage, multilayer compression bandaging, exercises, compression garment measuring and fitting, and extensive patient education. For more information, please call (914) 597-2198.